The ominous strains of The Doors, The End, should be playing through the halls of the prime minister’s office in Jerusalem. He is beset by four concurrent criminal investigations, any one of which could bring him down, should it result in an indictment. The event that marked the beginning of the end of Netanyahu’s nearly forty-year political career was the deal that his former chief of staff, Avi Harow, struck to turn State’s witness in return for a reduced sentence. Harow is reported to have recordings of Netanyahu’s conversations with subjects of the various police inquiries including former Israel HaYom editor, Amos Regev and Yediot Achronot publisher, Noni Mozes. They constitute the chief witnesses in one of the bribery and conspiracy cases being pursued. Unlike many other journalists or Israeli voters, I don’t rejoice in this development. Of course Netanyahu is corrupt and doesn’t belong in power. But neither do any leaders of any of the other parties who will doubtless fill his shoes when his own are retired. Deposing him will not lead to any change in Israeli politics. Undoubtedly, when the ax does fall you will find the liberal Zionist journalists from the NY Times, Haaretz, and other foreign publications writing rapturously about the chance for a “new beginning.” How Israel can “make a fresh start.” How it can now approach the Palestinian issue with fresh eyes. Mainly they will carry on about how much hope there now is for a change in Israel’s posture toward the Palestinians. And they will all be wrong. Israel, with or without Bibi, cannot change. Say Yair Lapid, a reputed moderate, becomes prime minister…he brings nothing different from Bibi. He has no new ideas. He doesn’t stand for anything striking or revolutionary regarding relations with the Palestinians. He won’t bargain away settlements. He won’t offer the Palestinians a state or a capital in Jerusalem. In his mind, he can’t. The Israeli public simply wouldn’t stand for it–or so the common thinking goes. Israel has a terminal case of clogged arteries. No politician in decades has advanced an original idea regarding peace. Israeli voters are afraid of their own shadows when it comes to considering change or compromise. Not to mention that they’re never made to pay a price for their intransigence. The U.S. always vetoes “anti-Israel” resolutions offered in the UN Security Council. The EU treads lightly even when its own projects in Palestine are destroyed by Israeli forces. Even the United Nations refuses to support its own employees when they’re dragged before Israeli judges on trumped-up security charges. As long as there is no price to pay, Israel will never change. So don’t celebrate when Bibi falls. Don’t look for new beginnings. Don’t hope for change. And when you read that journalist who offers clichés and wishful thinking on the subject, read it with a skeptical eye–and even call them on it. Don’t give them a free pass. Because world media are part of the enablers of Israeli oppression through their timidity and tacit acceptance of Israel’s narrative. When Netanyahu faces his darkest hour, he’s always at his most outrageous. The day of the last election, he demanded national TV air-time to make a speech calling on Israeli right-wing voters to return to Likud. The networks refused, so he took to Facebook. There he accused Barack Obama (he didn’t use his name, but used a dog whistle substitute) of renting buses to bring “Arabs in droves” to vote for the end of the State of Israel. In that tour de force of demagoguery he unleashed every trick in the book including racism, Arabophobia, and the lot. And it worked. He won another term. Much of this is true. There is unrelenting pressure on the police and prosecutor to serve indictments. But the pressure doesn’t come from leftists, who are a spent force in Israeli politics anyway. The pressure comes, first of all, from the majority of Israelis who are just plain sick and tired of the Bibi & Sara Show. Most Israelis want him to go. Not to mention, that he was never a popular leader to being with. Polls consistently showed he was beloved by hardly anyone. Israelis don’t have high standards for their politicians. They don’t put much stock in them. For good reason. Israeli politics is a venal, corrupt sport in which everyone is out for their own personal or communal interest. There is no such thing as bi-partisanship. Nor is there even a concept of the greater good, that is, the good of the nation. Everyone interprets the nation’s good as their own personal good. John F. Kennedy could never have written a Profiles in Courage about Israeli politics. Certainly not now, anyway. Returning to the language of his speech, he is wrong about one major point. There is no “coup” against him. And if there is, it is a coup of the whole, rather than of one tiny left-wing splinter. In other words, Netanyahu barely carries his own party, let alone parties he’s allied with, or parties in the Opposition. No one wants him. He has outlived his usefulness. They all want a new flavor of ice cream. They’re tired of the pistachio of which he and Sarah were so enamored. But as I said, this doesn’t open up new vistas or possibilities for change, or peace or anything of the sort. It offers up possibilities that the old boss will be replaced by a new boss, who is the same as the old one (as The Who so presciently sang). Lapid, Kahlon, Bennett, Lieberman, Saar, Katz–they’re all ready to rise to the call of the nation. To solemnly take their place at the helm of state. And none of them will do a damn thing different from Bibi. They’ll sound a bit different; have a slightly different accent; be more bellicose (Lieberman) or more nuanced (Lapid). But it all will amount to nothing in the end. Bloomberg’s coverage of the speech raised parallels between Bibi’s approach to his looming scandals and Donald Trump’s. Each inveighs against “fake news,” the “extremists” and “leftists” who ignore their victory at the ballot box. Each is a megalomaniac, completely self-absorbed and narcissistic. The world is united against each of them in their imaginations. Only the chosen few remain truly loyal. And even those will sometimes betray them to save their own hides. “The majority of the people of Israel, unlike the media, they love us, so we tell them how you are great and they love you,” Sara said to Trump and his wife. Trump’s popularity has sunk to a historic low of 33% in a recent Pew poll. Netanyahu’s is not much better. But there is a clear difference between the Israeli and American political systems. Israelis don’t vote for specific candidates to represent them. They don’t vote directly for prime minister as Americans vote for Congress and the presidency. So all an Israeli candidate needs to do is win his Party’s leadership primary. Then, if the public likes the Party candidate list (led by the Party leader), they vote for that Party. In that way, a Party leader who doesn’t command enormous respect from the general population can still become prime minister. Despite the differences in our respective systems, this is almost precisely what happened in the U.S. presidential election. The majority of American voters disapproved of Donald Trump. But a relentless, surreptitious campaign against Clinton so suppressed her vote that Trump slipped in. In both America and Israel, the voters held their noses as they voted for the least bad candidate or Party. Just as Netanyahu faces the net closing in on him, so Trump will face the same eventuality. I have little doubt that just as a mounting drumbeat of criminal charges is overwhelming Netanyahu, the same will happen to Trump. Mueller has convened a DC grand jury in order to bring indictments against a number in Trump’s inner circle including (but not limited to) Michael Flynn and Paul Manafort. Roger Stone and Carter Page may be close behind. Then the investigation promises to move up the food chain to Jared Kushner and Trump Jr. By the time Mueller is done, the Republicans (I believe) will be faced with the same stark choice they had regarding Nixon after the Saturday Night Massacre. Though Republicans control both houses of Congress (unlike in the Nixon era), they may have little choice but to show Trump the door. If their popularity ratings fall off a cliff along with his and they face near oblivion in Congressional races in 2018 or 2020, their hand may be forced. When faced with a choice between loyalty to Trump and saving their own skins, it’s clear what most of them would choose. As Trump faces his imminent downfall he will use similar rhetoric to Bibi. He will complain about a coup mounted by the fake media to overturn the popular will which gave him a “huge” unprecedented, historic victory. Just as Bibi shreys about “leftists” conspiring with the media to topple him Trump will complain about Democrats conspiring with CNN to bring him down. The nature of the charges against both men are quite different. Netanyahu, the second longest-serving Israeli prime minister, is accused of conspiring to improve press coverage by limiting the commercial activity of Israel HaYom, his own pet newspaper. This was a move to preserve his power. While the charges against Trump and his coterie involve conspiring with Russian operatives to win his election to the presidency. In addition, Netanyahu, who isn’t a billionaire like Trump, stands accused of petty corruption: of receiving gifts of cigars and champagne from wealthy political admirers; of his family accepting concert tickets and vacation stays in villas at the expense of other tycoons. Trump too is corrupt (though it isn’t clear whether these will be charges the special counsel will choose to pursue), but on a much larger scale. His corruption is on behalf of his own business interests: using his political position and power to advance his real estate schemes. Finally, along with potential criminal charges, Trump may face charges of violating constitutional provisions (such as violating the emoluments clause). This won’t happen to Netanyahu since Israel has no constitution. 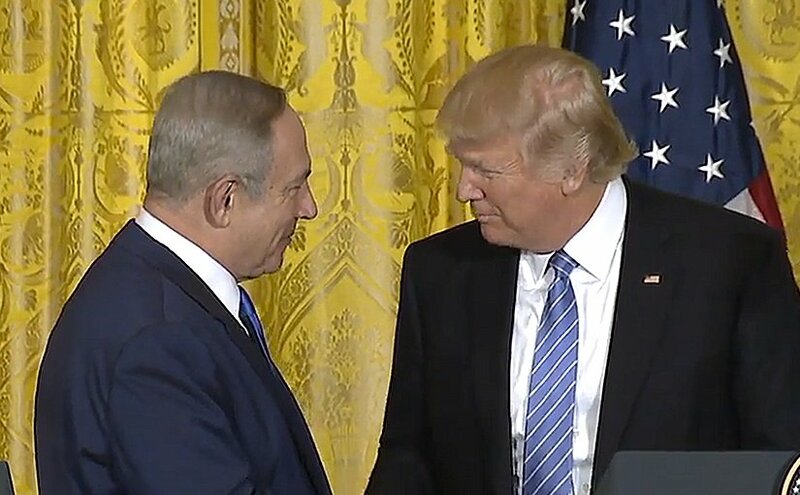 Bibi cannot be impeached, as Trump can. That makes the toppling of an Israeli prime minister a much more ad hoc affair. This is part of the strength of the American system that it offers hard and fast rules that leaders must adhere to. Violations of these rules result (at least potentially) in losing office. In Israel, they make these rules up as they go along. Every scandal involving every prime minister means re-inventing the wheel. There is a striking difference between the American and Israeli scenes after the downfall of the respective current leaders. While Israel cannot change, America might. Though not from the conventional Democratic Party, which offers policies only marginally different from Republicans. The hope for America lies in the candidacy of someone like Bernie Sanders or Elizabeth Warren, a truly populist candidate who can surmount the morass of party consensus and political convention. Unfortunately for Israel, there is no possibility of such a development.